Last week I began playing Warframe, a video game about robot gymnasts who spend all their money on clothes. I blew up a few bad guys, then took one look at my extremely intimidating inventory screen and decided I needed help. Fortunately, seeing as how I’m a high-profile influencer (not really) with a bunch of Twitter followers (mostly bots), I could easily turn to Twitter for support. “Ok, I made a character in Warframe,” I Tweeted. “What should I do first?” I got significantly more responses than I was expecting, and the advice kept rolling in over the weekend as I played. Warframe, for the uninitiated, is a free-to-play third-person shooter made by Digital Extremes that’s been steadily gaining in popularity since it came out in 2013. You can play it on PS4, Xbox One, or PC, and it’s gotten some major updates and content expansions over the years. A growing chorus of enthusiastic people—some on this very site—have been suggesting that now is a good time to dive in. In Warframe, you are a space ninja who goes on adventures. You carry three weapons and wear a Warframe, which is basically your modular battle suit. The Warframe defines your “class” and abilities, and the weapons define your fighting style. The experience points you earn are directly applied to your Warframe and your weapons, both of which you upgrade over time with mods. The more you play, the more cool gear you can unlock and upgrade. That’s… basically it? I mean, I know there’s more to it than that, but that’s the gist. I’ve only played a few hours on PC, and am far from a Warframe expert. However, I thought it might be interesting to share what I learned from the fine people on Twitter. 1. There are already a variety of beginner’s resources out there. A couple of people who responded to me were enterprising fellow games journalists who pointed me toward their own Warframe beginner’s guides. I actually haven’t read these yet, because I was curious how things would go if I only read my Twitter replies, but I feel I should share them here. Taylor Cocke wrote one over at Polygon that looks good, as does Brad Gallaway’s guide over at Game Critics. Several people recommended this YouTube beginner’s series from iFlynn, which I have bookmarked for when I really need to figure out what the heck is going on in this game. Several others recommended I keep the Warframe Wiki open. 2. I should just relax and play the game. I appreciated this tip, because Warframe almost immediately overwhelmed me with menus and tutorials and systems. I picked a starter Frame, unlocked my armory, installed a couple gun mods… unlocked a foundry, opened and immediately closed the marketplace... then spent like 15 minutes aimlessly doing spiral-jumps around on my ship. I felt pretty sure there was a “best” order in which I should have been doing things, and was thankful so many people quickly emphasized how little I should worry about that. As a longtime Destiny player, the size of Warframe’s galaxy map blew my mind. 3. ...or, I should delete it now and save myself a lot of hassle. 4. I should definitely save my Platinum for Frame/weapon slots. This guy’s tip for me simply read “WUKONG PRIME!!!!!!! !” I don’t know what that means, so I’m gonna have to take his word for it. 6. I should not spend real money unless I really want to. I get the sense that one of the fun minigames of Warframe is called Playing Warframe Without Paying Any Money. I like that game, because I like not spending money. 7. I should probably shoot things. 8. I should be glad I picked Excalibur as my starting Frame. I had already picked Excalibur as my starting Warframe. It seemed like the coolest starter Frame. I was glad of that, because a couple of people mentioned that he’s a pain to farm for if you choose to unlock him later, one even advising me to just delete my account and start over to save myself the trouble down the road. 9. I can have a dog!? This isn’t a tip, but several people informed me that there are pets in Warframe, and in particular, dogs. There has been much disagreement in my replies over which pets are the best. Cats seem to have the popular edge, but I’m so much more of a dog person that I think I’m going to have to get a dog, when the time comes. At least one person said I should get a bird, but I dunno, man. I think it’s gotta be dogs. 10. There is something called “Hek,” and I should use it to wreck. Not only does Hek rhyme with “wreck,” it also means I can say “Hek yeah!” when I finally get Hek. Whatever the heck Hek is. 11. Fashion is very important. 12. Movement is also important. Even with just a few hours under my belt, I can attest that all those movement tips are legit, and moreover, that the Bullet Jump is indeed probably the best thing about Warframe. Jumping around in this game has easily been the most fun thing I’ve done in it. Most of the fights in the opening questline have been pretty easy, so I spend an inordinate amount of time trying to leap around and get the coolest aerial kills possible. The more I play, the more I’m getting used to moving quickly. 13. I now have a space mom, and that should make me happy. Several people seemed excited that I now had a “space mom,” who I will assume is the lady who keeps coming onto my comms and telling me what to do. She seems cool so far, at least. I like space mom. 14. I shouldn’t rush to the Plains of Eidolon. The latest version of the game contains the “Plains of Eidolon,” an area that, according to at least a few people on Twitter, I should probably just avoid until I’m higher level. There was one dissenting voice, who advised me to “charge hard to the Plains of Eidolon” because the area is so fun. This set off another player who was sick of seeing low-level players on the Plains. 15. Lots of people have their own favorite Frames and builds. 16. Above all else, Warframe players seem very friendly. A lot of the tips I got were helpful. Some were contradictory. Others will make more sense once I’ve played more of the game. For all the specific things I’ve learned, my biggest takeaway is that people who play Warframe—or at least, people who play Warframe and offer tips to other players online—are unusually helpful and friendly. 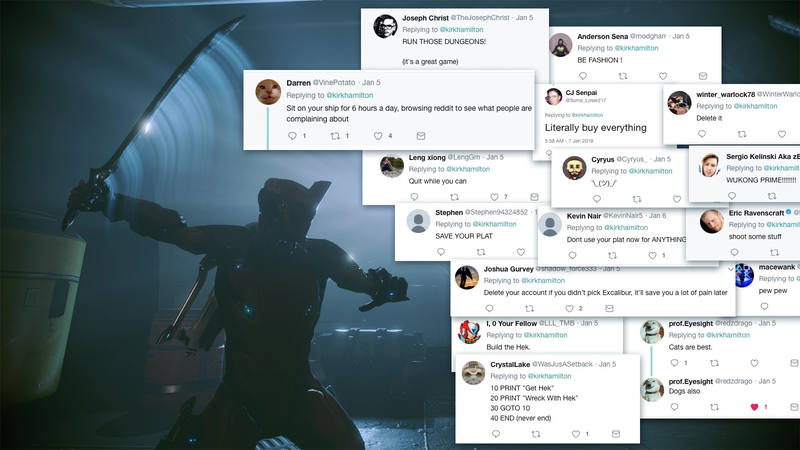 Both the nature and the volume of the responses I got indicate that the Warframe community is unusually welcoming, which lines up with the amount of helpful advice I’ve seen bouncing around in global chat whenever I log in. Definitely a good sign for any online game. I’ll be playing more Warframe in the coming days and weeks, and I’m pretty excited to get some more Frames, try some different builds, and maybe even go to the Plains of Eidolon. If you have any additional tips you think I should keep in mind, please share them below.